"Electrolysis of Water". 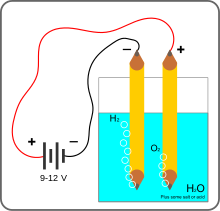 Experiments on Electrochemistry. अभिगमन तिथि November 20, 2005. "Electrolysis of Water". Do Chem 044. अभिगमन तिथि November 20, 2005.